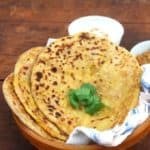 An easy and foolproof version of Aloo Paratha, an Indian flatbread stuffed with a spicy potato mixture, that I often make for the lunchbox, for me and my eight-year-old. Place all the ingredients except water in a bowl or in a stand mixer. Trickle in the water slowly, kneading as you go, until you have a stiff but pliable dough. Set aside for at least 30 minutes. You can make the dough a whole day ahead and refrigerate. Place all the ingredients in a bowl and mix well. Divide into 12 equal-sized portions and form into balls. When ready to use the dough, divide into 12 equal-sized portions and, again, shape into balls. Roll out one of the balls of dough into a disc, about four inches in diameter. Keep the center thicker and make the edges thin. Place the stuffing in the center and pull the edges over the top of the stuffing. Pinch to make a tight seal and squeeze off any excess dough. Flatten into a disc, flour both sides, and roll into a circle about six inches in diameter. Heat a griddle and spray with oil. Place the flatbread on the griddle and let it cook until golden-brown spots appear. Flip over and cook the other side. Flip over a couple more times if needed until the surface is evenly cooked and covered with golden-brown spots. Serve hot with chutney or a cucumber raita or Indian pickles. If you're seasoned at rolling out flatbreads, you certainly won't need 25 minutes of cooking time-- I usually roll one as I am baking the other on the griddle.